In Christ Alone: Is stress your lifestyle? Whilst I was thinking on what could be my next post title, the word just flashed my mind is STRESS. Then I let my thoughts to ponder over this word. Recent years this word is the reason for many cause in personal and social schema. 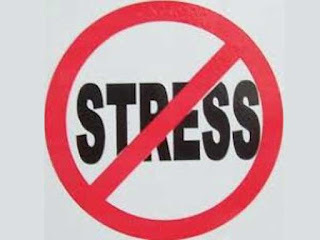 A state of mental or emotional strain or tension resulting from adverse or demanding circumstances is called Stress. Do you remember this word used by our grand parents?My personal feeling is it became a part of our lifestyle only in this generation.In fact it has been a prestigious word uttered by everyone. When people around asks you how was the week or the day? How many times our immediate response was " oh boy it had been a horrible week, completely stressed out" . Be it a office work, household work, business, even some people who does social work and ministry started using this word. Let's come to its definition part, so the stress arises out of mental or emotional or tension when the demanding circumstances are to be met. Alright, just wanted to post you a couple of questions for you to rewind your mind and renew your spirit. Would you not agree that our ancestors had demanding situation? Have they not used their brains and does physical work for inventions and tasks to be accomplished? Then from where does this word suddenly jumped and took over our lifestyle? Okay my next question would be what is the remedy or the steps taken to avoid this stress. People who are working from Monday to Friday, desperately waiting for Fridays to burst their stress out. Am I not right? We hear about TGIF ( Thank God its Friday) how funny it might sound.So Friday evenings is a party time, whatsoever it might be a metropolitan city or a small town . Metropolitan city pubs are full on every Friday's and they have night outs just to burst their stress level. The places which is not so familiar for pubs have tasmac and other recreational activities. These days stress impacts all areas of our day to day life. Starting from toddlers and up to age old man. It affects significant areas of our lives includes education, job, relationships specially husband and wife. Husband might sound that he is having lots of stress to meet the deadlines. Wife would say the same thing in a different version ( if a stay at home or a women who takes care of both family and her career). Whatever it may be the ultimate reasoning is everybody is under stress. I would say its just an attitude problem. How we look at things and act and most importantly how we speak. We all talk about being positive and there are hell lot of seminars, conferences, training which is all to keep us motivated. Was this all a part of our grand parents lifestyle? In fact they worked hard more than us. Nowadays life is pretty much simplified but we make it very much complicated.
" The tongue has the power of life and death and those who love it will eat its fruit.". So let's use the tongue to build ourselves and our lifestyle and not for destruction.. Stay focused and Stay blessed..!